1. What do you mean, you are the regular guards? 2. The lord is going to use his regular guards but your group can get in there and get the relic before them, that’s why I’m paying you so much. 3. Because I need deniability. The guards are locals, they have families, someone will tell the damned Priests and I can’t have that. You are unknown and can move on once the job is done. 4. Disease has laid low most of the guards. What remains are barely enough to defend the castle. 5. The guards will be confronting the villain en-mass. We’d send some but we need all hands. This will leave the objective mostly undefended. Your group hasn’t trained with the guards so it makes sense for you to act independently. 6. The barracks is filled with spies. I can’t trust any of them to do this task. First off, great article, and it’s nice to know other DMs have the same problem as me. In my current campaign, I made sure the party was created with some connectivity between them, via a heavily modified “Group Template” as used by the Fear The Boot guys. Well, it turns out he wasn’t a town guard, but actually part of a private security force that had taken on a seeming bad contract for the town, and just wanted to send some nobodys to fulfill it. Falsely assuming they’d all likely die and never return. Now, they’re involved in multiple plot lines and trying to figure out who’s actually in charge of this merc company that’s intentionally providing crap security to some jobs. Everyone is really engaged, and there’s lots on in-character discussions at the table about what they should do, how they should do, and who they should do it to. Yora- Yes, this is the eternal problem! I like playing with people who are new to D&D and tabletop RPGs in general, because of their unusual perspectives, and because it’s especially difficult for the DM to engage them in the beginning with usual hooks. My friend (and her character), rejected these calls to adventure and greed: “Why would we go into a dangerous hole in the ground? This creepy guy is not trustworthy! 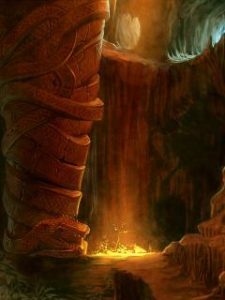 Why disturb tombs?” The whole idea of dungeon delving did not appeal to her the way it would to someone who grew up playing the game with “dungeons” in its very name. She persuaded her husband’s character to join with hers in escorting displaced the area’s starving, widowed and orphaned, displaced people NPCs overland to a safer city far away from the war-torn area. It was a pain to make stats, names and distinguishable personalities for these noncombatants on the fly. It serves me right for just thinking the PCs would note the neighborhood was suffering, and then follow hooks to get out of there to raid dungeons and make money. On a differently-related note, I like your 2, 3, and 6 especially, Ruprecht.